Sandberg's new Gaming Starter Kit makes it cheap to get going with gaming. 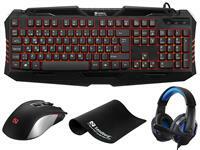 The complete pack with gaming keyboard, mouse, headset and mouse mat costs less than a gaming keyboard alone could normally cost. Each element features fantastic performance and great design, even with lots of LED lights built-in. The new Gaming Starter Kit is currently on the way to dealers. The www.sandberg.it website will show you where the nearest one is.